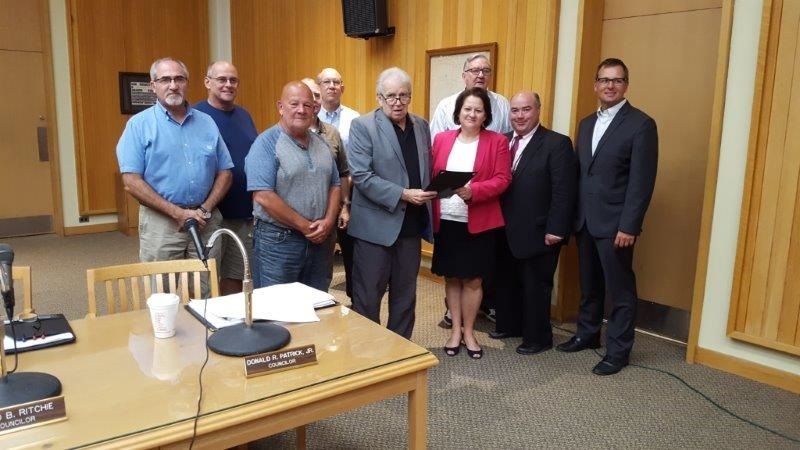 Pictured with the Common Council and Mayor Woodward is Superintendent Brian Pulvino, Director of Student Support Services Geri Geitner and Volney Principal Todd Terpening. FULTON, NY – Curbing chronic absenteeism is a top priority among officials within the Fulton City School District. Brian Pulvino, Director of Student Support Services Geri Geitner and Volney Principal Todd Terpening. So much so, district officials were presented with a proclamation by Fulton Mayor Ronald Woodward Sr. and the Fulton Common Council declaring September 2018 as Attendance Awareness Month. “… chronic absence, defined as missing 10 percent or more of school for any reason including excused and unexcused absences, is a proven predictor of academic trouble and dropout rates;” the proclamation read. Last school year, a total of 49,587 absences, 24,955 instances of tardiness, and 18,001 early departures from school throughout the Fulton City School District left equated to 25 percent of all students districtwide identified as chronically absent. To correct this pressing issue, the proclamation outlined how support and collaboration from the school district, parents, and community alike to celebrate good attendance habits can encourage students to improve attendance rates. Thus, the annual School Attendance Kickoff Celebration is scheduled for Sunday, September 16. 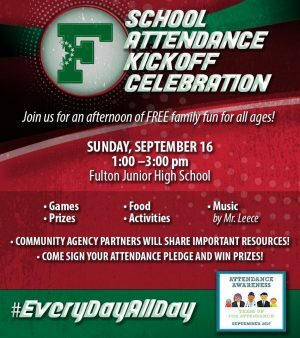 From 1-3 p.m. at the Fulton Junior High School district families can enjoy a free celebration complete with games, prizes, food, music, and activities. Community agency partners will be on hand to distribute information and share important resources. Following the “every day, all day” rhetoric encouraging students to show up each and every day and stay in school for the entire school day, all students are invited to sign an attendance pledge to show their commitment to good attendance.